Are you a fan of the United States Armed Forces? If so, then DRS may just be your new favorite ammo manufacturer — a remanufacturer, to be more precise. 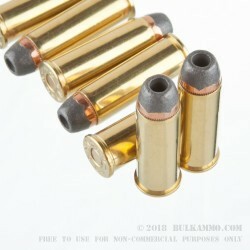 Every DRS cartridge is made with once-used brass collected from U.S. Military bases. They add their own powder and bullets to the mix, bringing it all together to make top-shelf cartridges at bottom-shelf prices. These once-used .44 Magnum cases are loaded with 240 grain hollow-point bullets, perfect for hunting medium game. 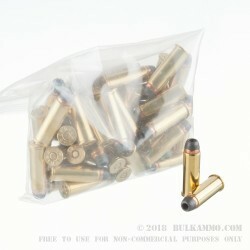 All DRS ammo comes packaged in bags rather than boxes, due to the nature of their remanufacturing. DRS .44 Magnum HP bullets weigh in at 240 grain, and their boxer-primed brass casing is safe for further reuse after careful inspection. Although DRS are meticulous about their quality control, it is important to remember that remanufactured rounds are more susceptible to case failures. 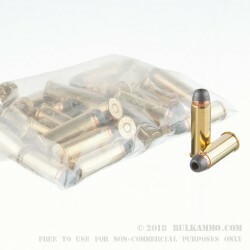 Furthermore, it is advisable to ensure your firearm is safe to operate with remanufactured ammo. Please consult your owner’s manual before using remanufactured ammo.